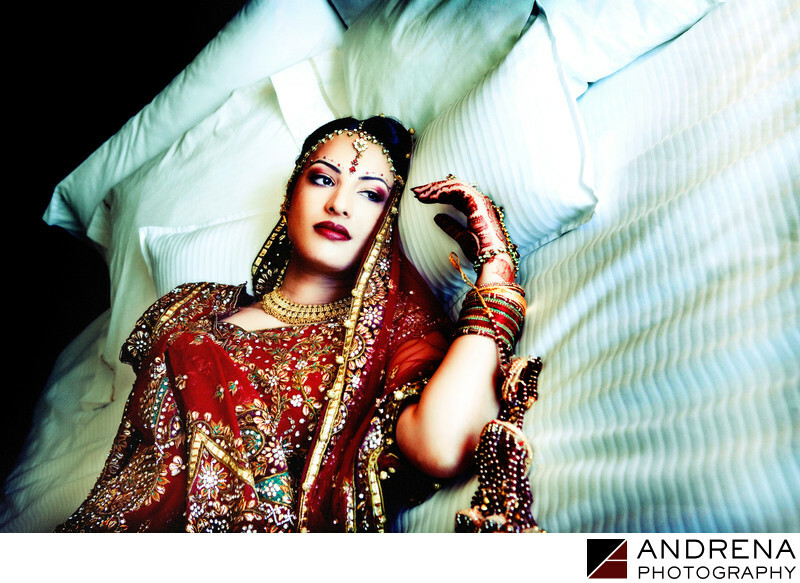 My beautiful Indian bride Sasha wanted to take a nap between her Indian wedding's ceremony and reception. Which of course means that I followed her upstairs and encouraged her to do a brief photo session before she caught some shut-eye. The wedding itself took place at the Westin South Coast Plaza, so once Sasha was back in her room, I encouraged her to lie on the bed, and then I positioned her arm until I was happy. Sasha provided some great expressions during our brief portrait shoot, and this one was my favorite. I added a blue-green tint to the shadows in her bedding, which created a more interesting color palette for this portrait. The interplay between red and blue always creates a psychological reaction in the viewer. The before and after of this photograph are quite different, which just goes to show how great a role Photoshop can play in bringing a photographer's vision to life. Coordination provided by Smita Mohindra at Ethnic Essence. Indian wedding photographed at the Westin South Coast Plaza in Costa Mesa, California.